We watched two documentaries this weekend. I'll talk about the first one in this posting and save the second one for a future entry. We've been on a documentary binge......what a wonderful genre. Thanks to NetFlix there are hundreds to chose from. We knew nothing about this film in advance, except the brief description on NetFlix. So we really had absolutely no preconceived notion or expectations. I'll give you a little background because you will not want to miss this special film. 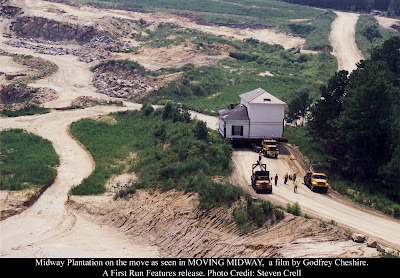 Moving Midway is a documentary by Godfrey Cheshire, a New York film critic. NewYork Magazine named it runner-up as the best documentary film of 2008. (http://nymag.com/arts/cultureawards/2008/52779/index2.html). It is a movie about a family....it is a movie about a plantation. Most of all though it is a movie about our country, the South in particular. 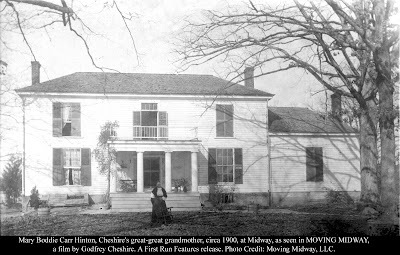 Cheshire returns to his family's ancestral plantation, Midway, in North Carolina in 2004 to discover that his cousin, Charlie Silver, who owns the land, has decided to have the buildings relocated. The lovely main house and outbuildings have been so encroached by growth, that they literally sit perched next to a busy highway, once a sleepy country road, and they seem poised to be gobbled up. Initially, it is a story of the relocation of buildings, which in and of itself would be a fascinating focus of a film. But this film becomes so much more. On his way to discovering many interesting facts about the house, that it is haunted for example, Cheshire also discovers that his family is much larger than he or anyone else ever knew. And the fact that his cousin is selling the land to allow a parking lot for a gigantic shopping center to be built with all of the requisite stores has a much broader impact. "What is a Southern plantation? A relic of a bitter, divided past? A vanished realm of aristocratic charm and elegance? An impediment to the modern South’s frenzied effort to turn itself into an anonymous landscape of superhighways and strip malls? Or, perhaps, all of the above, plus something else as well: a site for understanding and reconciliation, a meeting place of past and present, black and white. While beginning a dialogue on the meaning of Midway from their very different perspectives, Cheshire and Dr. Hinton examine how the Southern plantation, a crucial economic institution in early America, generated a powerful, bitterly contested mythology that was at the center of a string of American cultural milestones, from Uncle Tom’s Cabin and Birth of a Nation to Gone with the Wind and Roots." This film becomes a wonderful journey of discovery about so many things for the viewer as well as Cheshire and Hinton and their families. It truly transcends itself and becomes a remarkable, enlightening experience about our nation's true history. And we witness two distinct branches of a family as they get to know one another. Watch these two short video clips to get an idea. The first is the trailer for the film. But the second is a television ad for the film which ran at the time of the '08 presidential election. It has some of the same footage but I think it illuminates the larger global themes of this wonderful documentary. 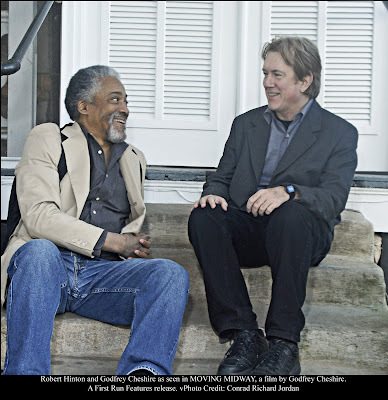 I was literally captivated every exquisite second of the 98 minutes of this film (I was particularly enchanted with Dr. Hinton who I found very appealing). It was so many things and it was such an amazing and rare film experience. Please see this movie. You'll have a beautiful experience I assure you. I somehow feel changed by having seen it.